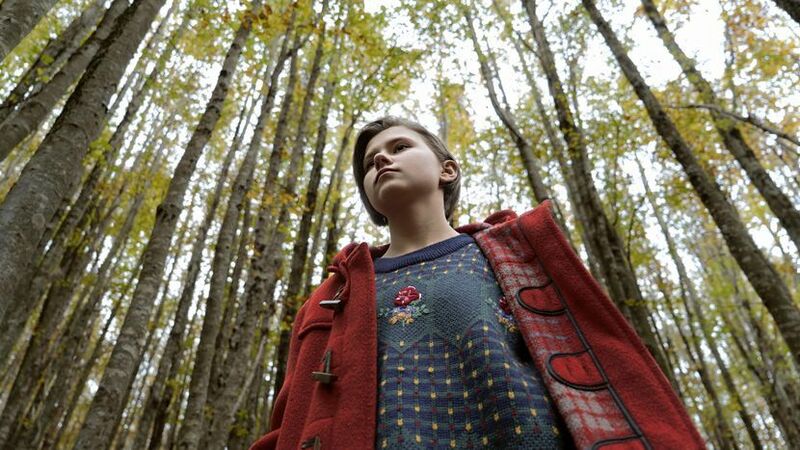 SICILIAN GHOST STORY is a slow-burn drama that tells the tale of a mafia abduction in Sicily from the perspective of the teenage girl who had a crush on its victim. Descriptions of the film often play up the movie's fantasy elements but I found this to be a canard. This is fundamentally a beautifully observed and melancholy tale of thwarted love and societal injustice. The fantasy elements, such as they are, are lightly handled and can be read as mere imagination and intuition. The story takes place in a Sicilian hilltown amid verdant fairytale woods rather than in the dusty, oppressive Sicily of the Godfather films. In a sunlit, giddy opening, our heroine Luna (Julia Jedlikowska) follows the kind, beautiful Giuseppe (Gaetano Fernandez) into the woods, and like any knight in shining armour, he saves her from a rabid dog. She then plucks up the courage to give him her love letter, and revels in this success that night by sending signals by torchlight to her best friend Loredana (Corinne Musallari). But the next day at school, Giuseppe is nowhere to be seen, and Luna simply can't accept her parents and teachers explanations that he's sick or gone away. The societal silence around his kidnapping, punishing his father for becoming an informant, is claustrophobic and brings Luna to the edge of madness. She cannot fathom why no-one will help her find her beloved when he can only be being held in the surrounding villages. Memories of their brief time together draw her back to the woods, and to the makeshift house where he is being held. Her mother approximates a kind of buttoned up Mrs Danvers with her cool hardness and the owls are not what they seem. And all the time, poor Giuseppe is still imprisoned, clinging onto Luna's love letter but ever weaker and more apathetic. The film works beautifully as an allegory of the impossibility of innocence in a corrupt world. Even outside of the main story, we see Loredana beaten by her father so much that she doesn't even seem to be bothered by it any more. At any rate, it gives her a magnificent toughness that puts her in a class of Badass Movie Best Friends all of her own. But the real victory of the film is to be unflinching in its depiction of violence but also to give us some room for hope without seeming forced or simplistic. After 90 minutes of very slow action, and an ending that I thought was all its own, the movie continued and I was rather glad it did. It's also beautifully shot by Luca Bigazzi (YOUTH) and depicts a Sicily quite unlike that we have on screen before. SICILIAN GHOST STORY played Cannes 2017. It was released in Italy earlier this year. It goes on release in France on November 15th and in Argentina on December 7th. Tickets are still available to see it at the BFI London Film Festival 2017.